Sciblogs | SciFund Challenge – Target achieved! SciFund Challenge – Target achieved! Glowing bacteria attract over $3000 for science in 15 days! For those who don’t know, this month I am taking part in the SciFund Challenge, raising money for my research using the RocketHub crowdfunding platform. My project, Evolution in Action, involves studying how infectious microbes evolve to cause disease and I am raising money to sequence the genomes of my evolved bacteria to unravel the genetic basis of their evolution. It costs about $100 per genome, so the more money I raise the more genomes I can sequence. So it took just over 2 weeks to reach my $3000 target. I’m currently at $3,288 – that’s almost an extra 3 genomes. Whoohoo! And there is still more than a week to go! I’m really looking forward to doing a little analysis of all my contributors when the challenge is over to find out how many I actually know and how many are strangers, and how those strangers found me. So a huge thanks to all who have contributed and everyone who helped spread the word. I couldn’t have done it without you guys. And for those who still want to contribute, there is still time, and we have no shortage of evolved bacteria whose genomes we would like to sequence so the more money we raise, the better! 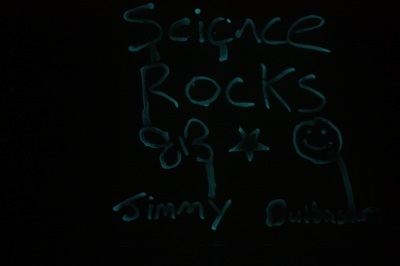 Now we are getting on to preparing our rewards, which includes writing our contributors names/logo’s in glowing bacteria. Watch this space! Congratulations Siouxsie. Not only good or your research but an inpiration to the rest of us to get off out butts and think outside the trad funding square.